Honfleur: Musee Eugene Boudin and Maisons Satie. He never attained the position of Peintre de la Marine (Painter of the Fleet), a title awarded by the Minister of Defence in France to artists who have devoted their skills to the sea, but the poet Baudelaire was among those to recognise and encourage a talent regarded now as a precursor to impressionism and he has a museum in his name in the cobbled streets that rise from the port of Honfleur. The notes in the visitors’ book complain its only fault is it does not contain enough works by Boudin himself. 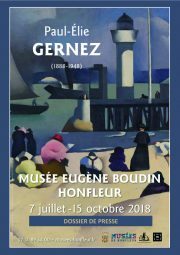 Until October 15, another Seine estuary artist Paul-Elie Gernez (1888-1948) takes centre stage in a very comprehensive exhibition bringing together his wide-ranging output from wood cuts to designs for embroidery and stylistic experimentation that echoes pointillism and cubism. The choice for the exhibition flyer is “Baigneuses devant la Jetee” (Bathers at the Pier), a relatively early, accessible work from 1920 only typical of his output in its faithfulness and skill. The bathers are not yet bathing, but fully-clad and well-rounded, more suited to bobbing than swimming. Their bold solidness is of a piece with the rest of the composition that captures the eternal child in all of us, from the priest in black from top to bottom to the rotund madame in pink, on a summer’s day beside the sea. Years later, life on the beach is still a central theme, but the style has become spontaneous and impressionistic. His atmospheric Deauville beach scene of 1939 is ostensibly similar to his Trouville beach scene in 1946. We have the same characters – a man in bracers seated with his back to us, a woman bather ready for the sea, fellow beach-goers casually arranged around them, absorbed in quiet tasks or just enjoying the day – but the later picture is in pastel, a medium Gernez made his own and that is suited to the texture of the clouds and the haziness of seaside days. The 1939 work is in oil. If his decorous beach scenes are populated by people overdressed by today’s standards, Gernez also painted nudes in every style and setting – with iris and sea shells, warming themselves by a blazing hearth or abandoned luxuriously on a flowery shawl. Similarly, he experimented with still life, especially flowers but also the fish, as on sale today at the Honfleur quayside, and depicted in pastel on a crumpled red check cloth by Gernez. A one-off that catches the eye is the sturdy but diminutive, realistic rather than sentimental “petit ramoneur” (little chimney sweep) of 1915. He’s a child with the bearing of a man, cigarette in hand and no levity in his face. Gernez a year later painted his own portrait “with moustache”. He is also with a collar and tie and the fixed expression of a prolific, highly respectable hard worker, but it is the comparatively effortless Boudin who inspires the visitors’ book plea for more. Not only are Boudin’s works generally small-scale, they are few but charming as Boudin’s modest personality and natural understanding shines through. The two painters are linked not just by Honfleur and the sea: Boudin’s clouds that capture the layered immensity of the sky and his beach scenes – or as he put it modestly “my little ladies on the beaches” – provided inspiration for Gernez. If there’s too little Boudin, there is even less Dufy, but the two on offer are an unexpected bonus on the museum’s top floor, which also has a view across the rooftops to the port and the Pont de Normandie. Long before that transformed the land and seascape, we have Dufy’s version of the Normandy resort of Sainte Adresse around 1950 and his vivid Normandy cornfield of 1935: with a flourish he takes you into the tangle of corn ears growing in all directions, in which any conventional sense of perspective is irrelevant. For those who leave the Musee Eugene Boudin hungry for more, a Honfleur museum pass gives access to four museums for 13 euros. The other one we managed to squeeze in was the “Maisons Satie”. Satie (1866-1925), like Boudin, was born in Honfleur and inhabited a surreal, floaty world not far removed from impressionist light-filled clouds. By his own admission, Satie did not fit any obvious category. He painted and wrote words as well as music, explaining he was not so much a musician as a phonometrician (measurer of sound). His most famous works are Les Gymnopedies and Morceaux en Forme de Poire (Pieces in the Form of a Pear), so it is entirely appropriate that the museum’s first room contains only a giant pear with wings, gently moving up and down, as the representation of Satie’s soul. Other installations take us through Satie’s living days beginning with morning prayers and his quarrels with religion and ending in the bars of Paris with Cocteau and the other luminaries of the day. They lead us up to a totally white, dreamy, light-filled attic room where a white pianola plays Satie’s work and then they take us back down to a plush velvet cabaret theatre where we watch a film of Parade and listen to the jeers of the first audiences. Then they were bewildered by the surreal one-act ballet. Now, especially after an hour spent in Satie’s magical world, we marvel at the coming together of the talents of Jean Cocteau, Pablo Picasso and Erik Satie. We may well wish we could have lived in such heady days as we hand back the audio-sets and return to the streets of thronging tourists buying seaside kitsch.